I promise not to go on about it in future blogs but I have to record that I have met my short term target to reduce my weight by 20lbs. When I stood on the scales on Monday morning this week, I was 20lbs lighter than I was on 9th March when I had decided I would try to lose that amount. I'm keen to remind myself that I have not been, and am not on, "a diet". I've changed my lifestyle so that I eat mostly the same things as before but less of them - mind you, my garden compost heap is testament to the fact that I am eating a lot more fruit. And I am more active of course. My efforts have paid off over the last 10 weeks and I am very pleased (not too smug I hope) with myself. I am still overweight but I'm confident that more pounds will go in the coming weeks. I'm not in a rush though and I am no longer focused on the issue. This week, I hope to complete the other part of my short term target; a longish walk. 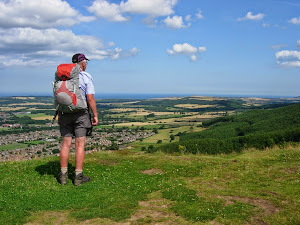 On Friday I plan to walk from Caterham, Surrey, west along the route of The North Downs Way to Dorking. I'll stay at a Bed & Breakfast overnight (no wild camping on this trip) and then return along the same route on Saturday. It's about 16 miles in each direction. Some may wonder "Why The North Downs Way?" Well, my start point is close to my daughter and family's house and they will put me up for the night before and after the walk. And, more importantly, they will look after my dog Holly - a 10 year old Border Terrier who loves to walk but wouldn't be able to manage the distance I hope to cover. My Weight: 12 - 18 May -2lb. Since 9 Mar (10 wks) -20lbs.